Post-doctoral fellow Magali Millecamps shows off the new laboratory space for pain research, part of AstraZeneca’s $2.5-million investment in McGill. Millecamps studies complex regional pain syndrome (CRPS), a chronic condition triggered by injury to the bone or soft tissue, in the hope of improving treatment for this little-understood syndrome. It’s a world of hurt out there. Pain is the number one reason people visit doctors, and the indirect costs of chronic pain—such as increased absenteeism and decreased productivity in the workplace—are estimated to cost billions of dollars annually in Canada alone. Now, a new collaboration between AstraZeneca Canada, part of the multinational pharmaceutical company, and the McGill Centre for Research on Pain (MCRP) aims to understand how chronic pain works—and thereby improve its treatment and prevention. McGill has a storied track record of pushing the pain envelope, from emeritus professor Ronald Melzack’s revolutionary insights into how we experience pain, to psychology professor Jeffrey Mogil’s discovery of gender differences in pain perception. (For more on Mogil’s latest research, see “Sharing the Pain” on page 2 of this issue.) It’s precisely this kind of innovation that inspired AstraZeneca to choose Montreal as its North American base of operations in 1994. Jeffrey Mogil, the Canada Research Chair in the Genetics of Pain, sees the partnership with AstraZeneca as an opportunity to add to the exciting mix of pain researchers at McGill. AstraZeneca is interested in further understanding functional changes in pain perception, in the hope of creating new drugs that home in on the specific proteins that create pain. The company is also delving into the role of genetics in pain perception and how biomarkers (elevations of certain substances in blood or tissue) might predict a potential therapy’s effectiveness before it’s given to test subjects. AstraZeneca maintains right of first negotiation for discoveries that might result from this research, but the ownership stays firmly at McGill. “It’s key for us to protect the ability of McGill scientists to pursue research hands-off and to publish freely,” stresses Walker. The AstraZeneca money was also used to create over 10,000 square feet of new research space in the McGill University and Génome Québec Innovation Centre. The new labs feature multi-user animal-behaviour testing facilities, including a rodent magnetic resonance imaging (MRI) unit. “Space is always at a premium,” says MCRP director Bushnell. “This collaboration allows us to do many things that wouldn’t have been otherwise possible.” An electrophysiologist at the McIntyre Medical Building, for example, might need to do occasional behavioural work on animals. The new space would allow her to do so without sacrificing valuable lab real estate or incurring the sizable expense of retrofitting that space so it is conducive to animal work. The new space allows McGill scientists the freedom to conduct more contract research for pharmaceutical companies. In addition to paying well, contract research is an invaluable way for academic researchers to apply their expertise to the real-world application of drug prototypes, and to further the sample size of their own test studies. AstraZeneca’s investment is just the latest stage in a relationship that has borne much fruit over the years. 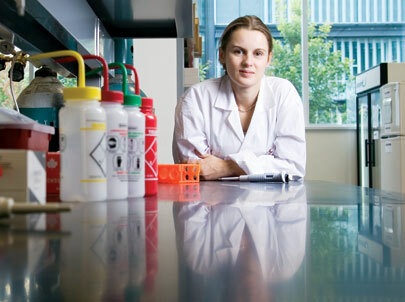 Many McGill grads have gone on to work in AstraZeneca labs and, in turn, two of the company’s scientists hold adjunct appointments at the University. Researchers from both organizations frequently mix it up at meetings and social functions. AstraZeneca also supports McGill’s annual Pain Day, where dozens of Quebec academics gather to share their current research. Add the new lab space and appointments into the mix, and the bottom line is clear: this collaboration is good news, for both pain researchers and pain sufferers. The McGill Centre for Research on Pain receives funding from the Louise Edwards Foundation.